1st April 2019. 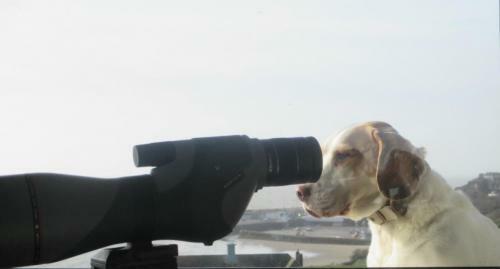 The National Coastwatch Institution has recruited its first ‘watchdog’ to help keep watch along the coast. As part of Project WOOF (Watchdogs Overlooking Our Foreshore), several NCI stations have been training canines to support their watchkeepers.in their duties. A spokesperson for the charity said “Our watchdogs have superior eyesight, sense of smell and hearing and use these senses to help spot people in distress. They are proving to be efficient support for our watchkeepers – although we do have some problems when people are throwing balls or sticks on the beach. Our dogs just want to join in”. As this project is proving so successful, the charity is considering training other animals such as cats, ferrets and pigeons to assist watchkeepers in their duties. Photograph shows watchdog Fido keeping a good watch.